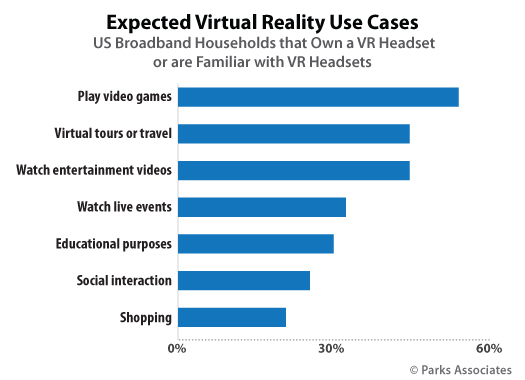 A new Parks Associates report finds gaming remains the primary use case for VR (virtual reality) headsets. Virtual Reality: The Evolving Ecosystem finds consumer-reported familiarity with VR technology has stayed at approximately one-fourth of US broadband households between 2017 and 2018, with gamers most likely to be familiar with this technology. Among consumers who own or are familiar with VR, 54% use their headset or would use it for gaming.